As a female traveller who often travels solo, it’s imperative that I stay not only in a safe environment, but also in a welcoming one. It’s important that you choose your accommodations (and neighbourhood) carefully. On that note, have you ever considered staying in a convent or a monastery? The Good Night and God Bless guide lists a number of lodgings around the world that are categorized as Open Houses, meaning open to tourists looking for simple but good quality accommodations at a lower cost. There are also Spiritual Retreats. The House of the Redeemer is situated in the Upper East Side of New York City and is run by the Episcopal Church, which offers hospitality to people of all faiths and nationalities. The building is a designated New York City Landmark of cultural, architectural and historical interest. Single and double rooms are available, some with air-conditioning and ensuite bathrooms. Musical and other cultural events are held here throughout the year. Alma Mathews House is situated in a quiet tree-lined street in Greenwich Village West. Managed by the United Methodist Women’s organization the complex is close to Christopher St–Sheridan Square train station as well as cafes, parks and shops. Comfortable, inexpensive accommodation is offered to any person or groups of people who are involved in some way with a non-profit group or agency. Most guestrooms share a bathroom but other guestrooms have ensuite facilities. Wheelchair access. The Society of St John the Evangelist is an Anglican religious order governed in the USA by the Episcopal Church and the Anglican Church of Canada. The monastery is located on a tree lined avenue which follows the curves of the Charles River in the midst of the campuses of Harvard University. The hospitable monks who live here run a monastery guesthouse with a number of single and double guestrooms available for those who might like to combine a visit to Boston with a religious retreat. Guestrooms are fitted with a washbasin and offered on a share bathroom basis. Meals can be taken with the brothers in the monastery refectory. Guests are welcome from Tuesday to Friday and depart on or before the following Sunday. Parking at the monastery is limited to those with accessibility needs, however there are parking garages within a block of the Monastery. The Sanctuary B & B is in the heart of Florence (near the Duomo) and is run by an order of Catholic nuns, the Suore Oblate dell’Assunzione. 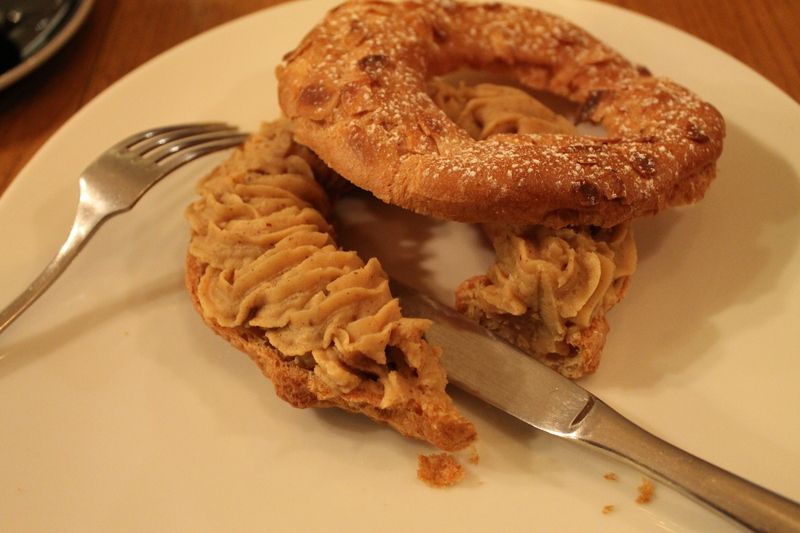 The location is ideal for exploring the tourist sites of Florence on foot. 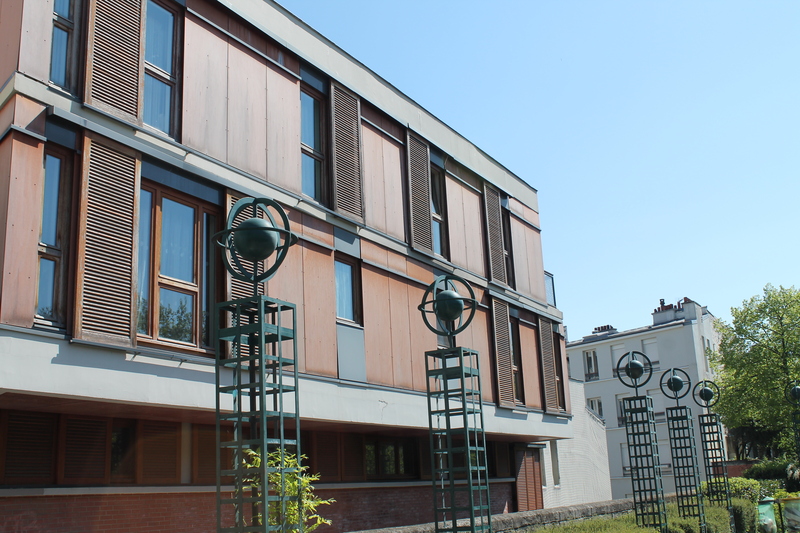 The convent building is a former 15th century palazzo and recently the ‘hotel’ has undergone a substantial facelift and the facilites for guests have been upgraded. Rooms with ensuite bathroom are available and cheaper rooms are offered on a share bathroom basis. The spotlessly clean guestrooms are roomy and well furnished and noise is not a problem as the street has recently undergone traffic restrictions. 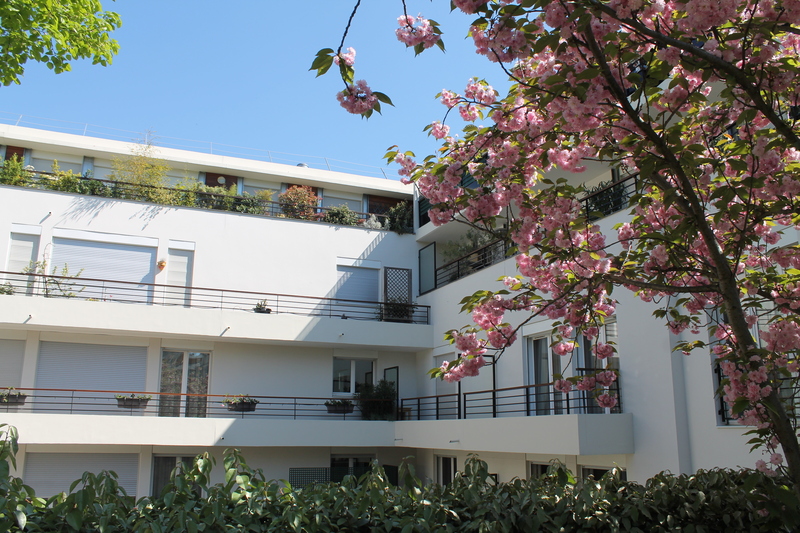 Guests will be pleasantly surprised by the large private garden to the rear of the building. Breakfast is served daily and facilities include elevator, internet kiosk and air conditioning in all rooms. Shops and restaurants are close by. Like many similar establishments religion isn’t spruiked here. However, guests are welcome to join the sisters in daily Mass if they so wish. The Sanctuary B & B is a comfortable, inexpensive base in Florence and with a brand new website up and running, bookings can be made online. In Rome there’s a lively and well-known convent near the Vatican called Orsa Maggiore for Women Only (not in the guide). I haven’t yet stayed in St. Katharine’s below, but an office colleague of mine raves about the place. The earlier you book at St. Katharine’s, the cheaper the rates. Personally, I find their rates a bit steep, which is why I stay at The Penn Club. St. Katharine’s is in East London. The Penn Club is in the heart of Bloomsbury and a 15-min. walk from St. Pancras train station. Situated in central London it is hard to imagine a more peaceful urban setting for a short stay in London, a holiday from abroad or a retreat. St Katharine’s has a rich history of hospitality and we look forward to welcoming you whether you wish to come for a day or to stay overnight. We have the rare privilege of being a few minutes walk from the river Thames in the East of London but still just moments from Limehouse DLR station. A wonderful chance to step out of the city but not to leave it. In keeping with the peaceful environment, there are no televisions in the bedrooms, however complimentary high speed WiFi is available throughout St Katharine’s. Guestrooms are ensuite and our spacious lounge, conservatory, garden and library are all a wonderful settings to spend time relaxing or working during your stay. Continental breakfast buffet is served from 7.30-10am, offering a selection of freshly baked breads and croissants, cold meats, cheese, eggs, cereals, yoghurts, fresh fruit, toast, tea & coffee. On-site car parking is available. Our garden is home to undisturbed wildlife also finding sanctuary at St Katharine’s. You can often see blackbirds, wood pigeons, squirrels in the sheltered space of our garden. You may also be interested to go across into the rose garden, where you can find the rose bush planted by our patron Queen Elizabeth II during her last visit. 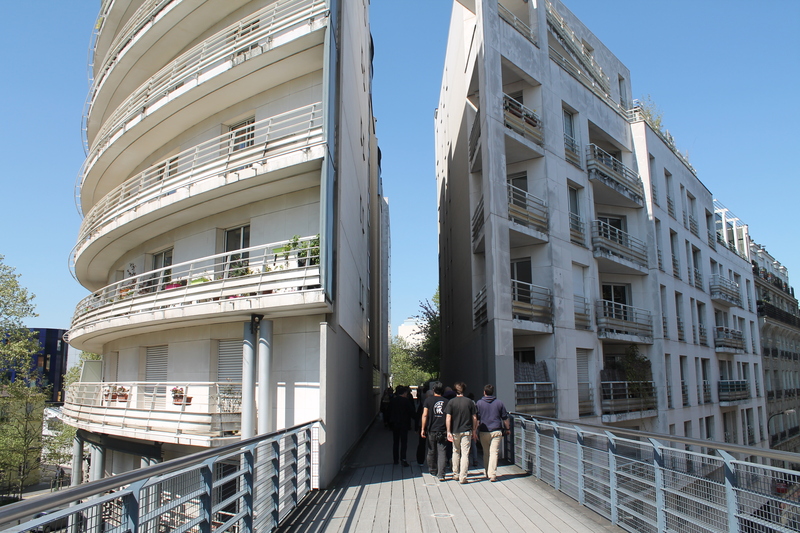 It’s not really called the Paris High Line, it’s called la Promenade plantée or la Coulée verte, but New York City’s High Line project was inspired by the Parisian Promenade plantée (tree-lined walkway), completed in 1993. 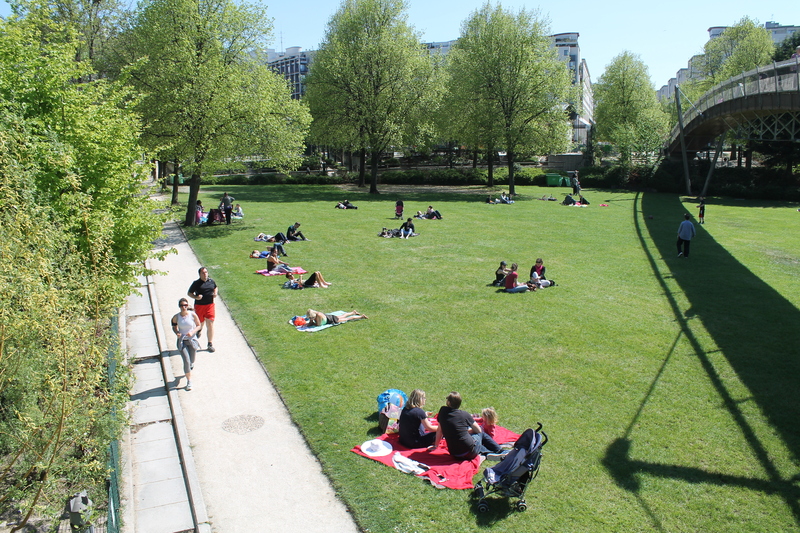 We are currently enjoying exceptional weather in Paris. Today couldn’t be more perfect – cobalt-blue sky, light wind to blow the pollution away, and a cool 17°C. 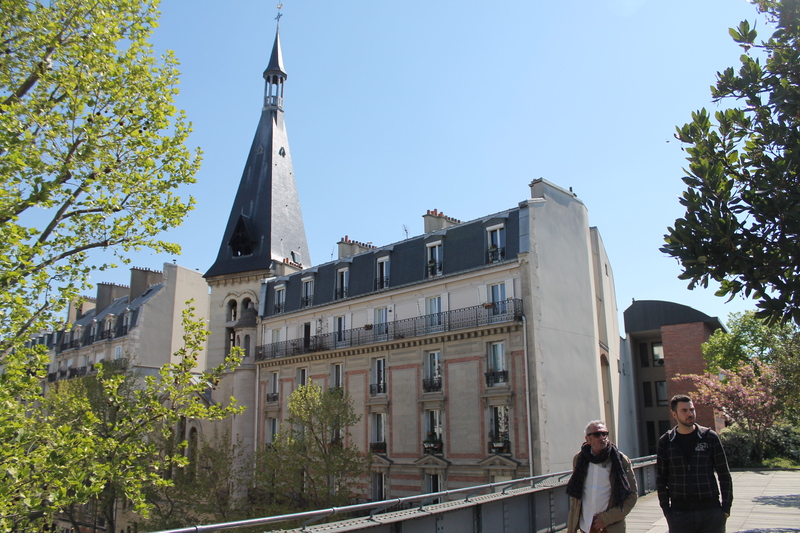 A perfect day to head over to Bastille and the 12th arrondissement to walk the High Line. 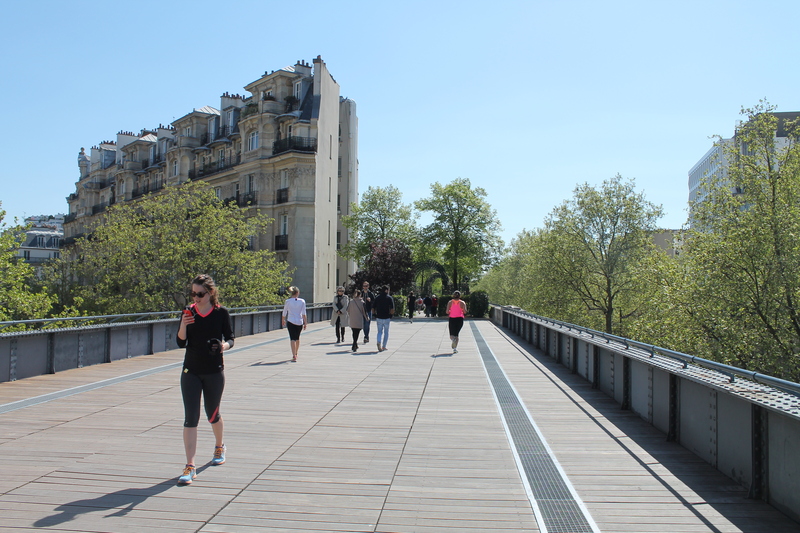 Contrary to the NYC promenade which is 1.45 miles long (2.33 km), the Paris promenade is 3 miles long (4.8-kilometer). The diversity of plants as well as architectural styles, mostly dwellings, that you pass by is interesting. A slice of Paris. 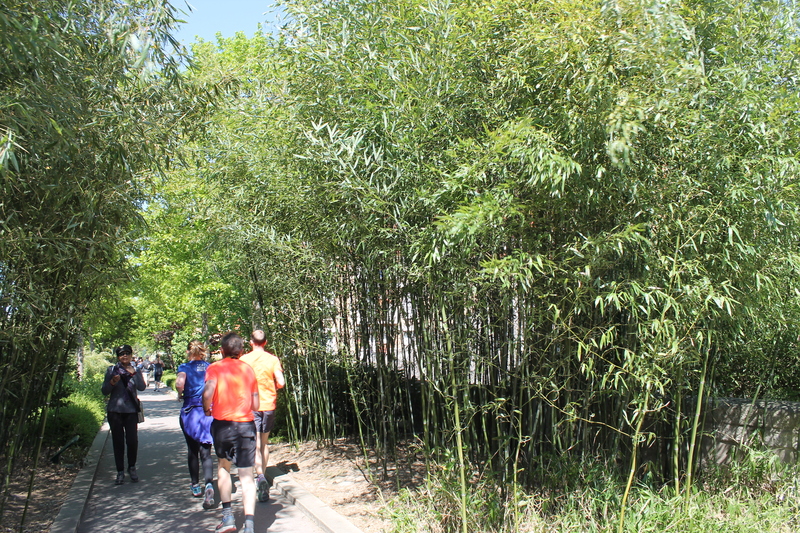 The photo below is a bamboo grove. I can’t tell you how relaxing and enjoyable it was to stroll along at your own pace, feeling the sun on your face and hearing the birds chirping. No cars, no noisy scooters…just joggers, pedestrians, space and nature. Because I went fairly early this morning, there weren’t many people. But I hear it gets quite crowded on Sunday afternoons. Too bad I live on the other side of the city, otherwise I’d be here all the time. 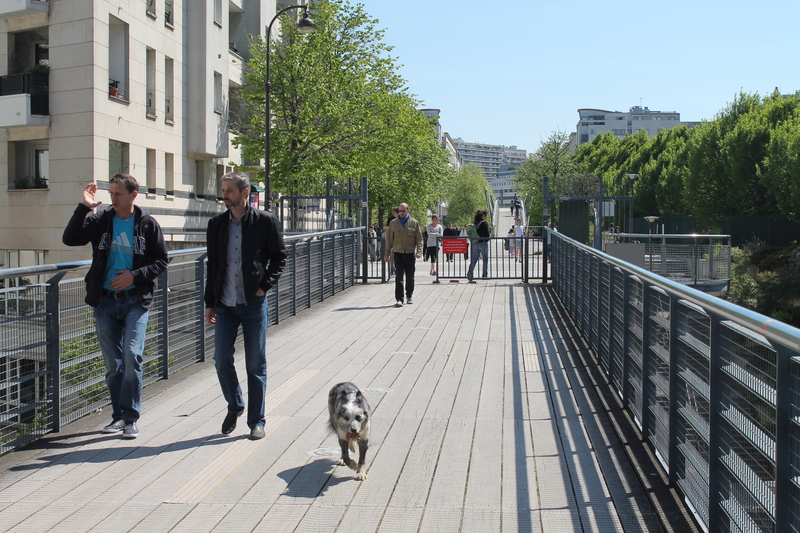 Picknicking Parisians and below that, a happy walker. See, this is what I couldn’t do in Naples….walk around freely with all my stuff strapped on me (camera, backpack, purse). 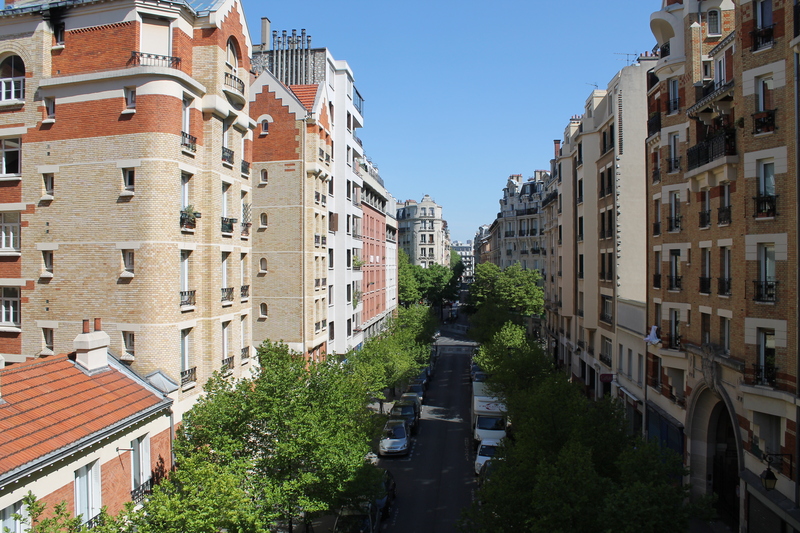 When you reach the end, you turn right at some point and come out onto the avenue Daumesnil. 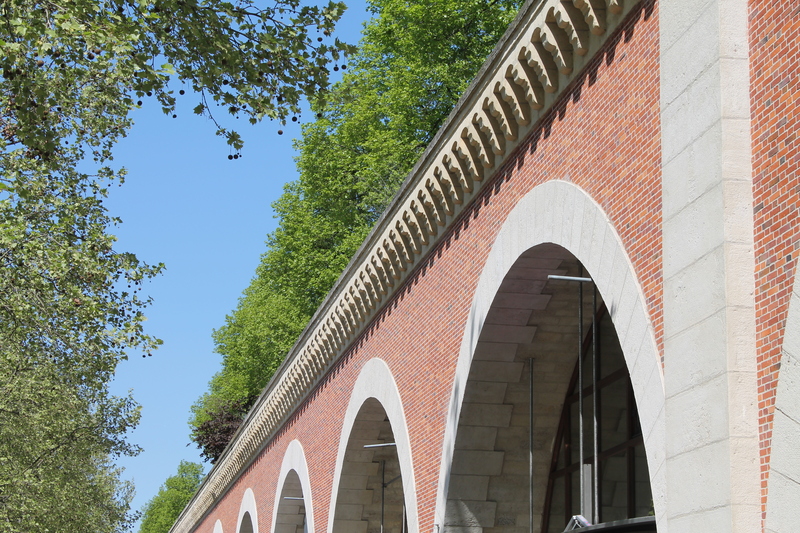 Here’s the original “Viaduc de Bastille” constructed in 1859 and which carried the railways of the Paris-Bastille-Vincennes train line. Now they are design shops and artist workshops. 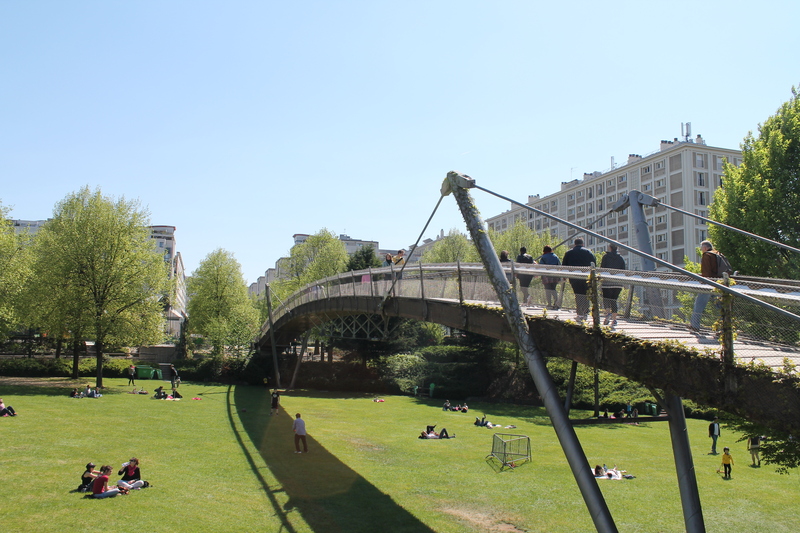 The promenade runs along the top of the viaduc. 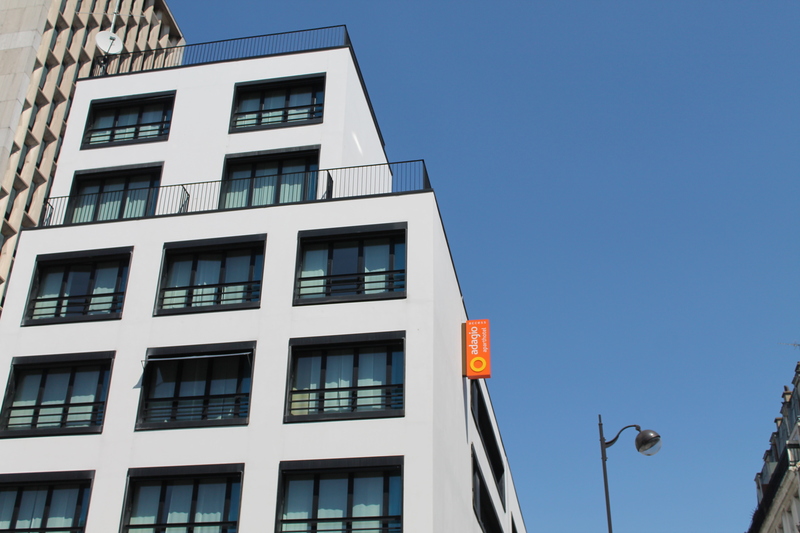 This self-catering apartment-hotel, steps from the High Line and 10 minutes south of place de la Bastille, looks like a good place to stay if you’re visiting Paris. The longer you stay, the cheaper it costs. Here’s how to get to the starting point. 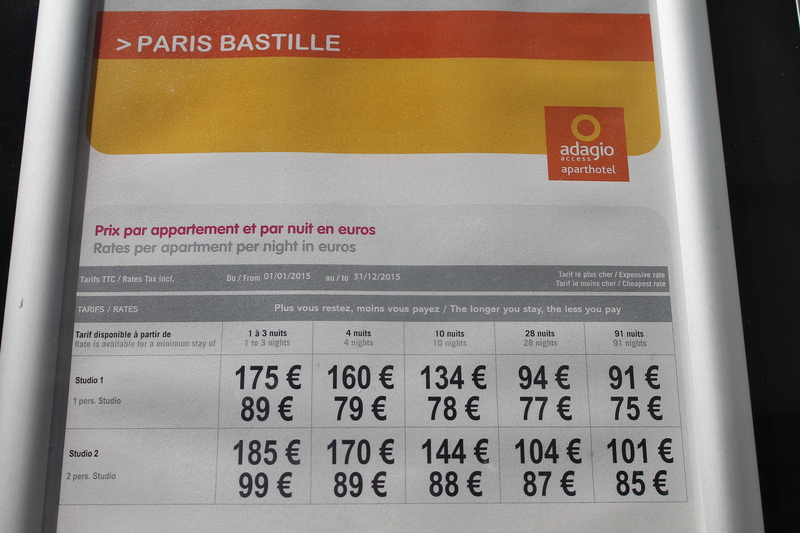 Take the metro to Bastille and take exit number 4 (rue de Lyon). 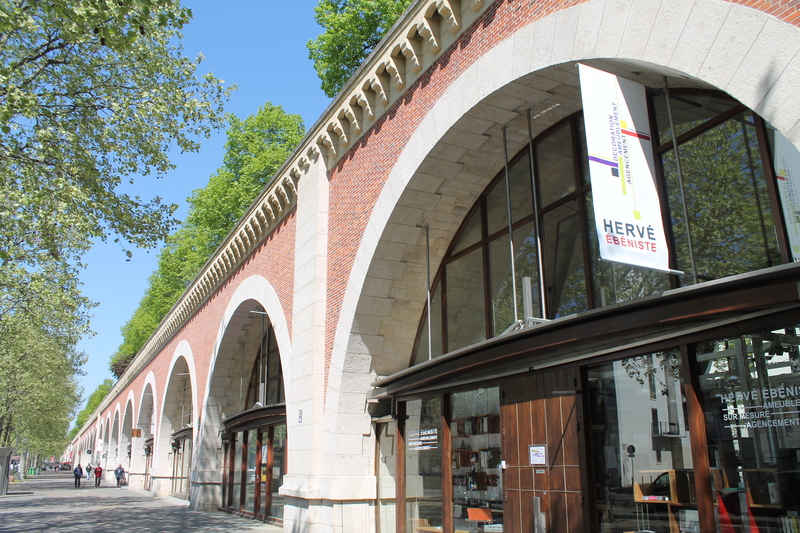 Walk south along the rue de Lyon (past the new Paris Bastille opera house) about 10 minutes until you get to the beginning of the viaduc at numbers 44-46 rue de Lyon. Take stairs up to entrance. Bonne promenade ! 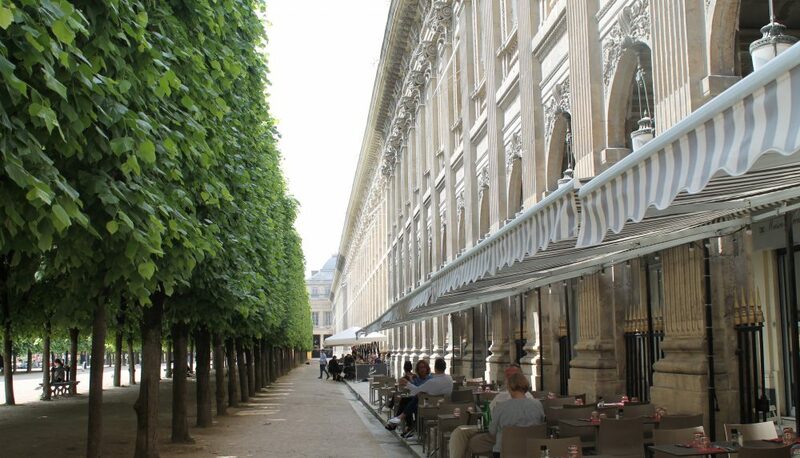 So last night I asked friend and fellow-blogger, Beth from Toronto, what it is exactly that she loves about Paris. 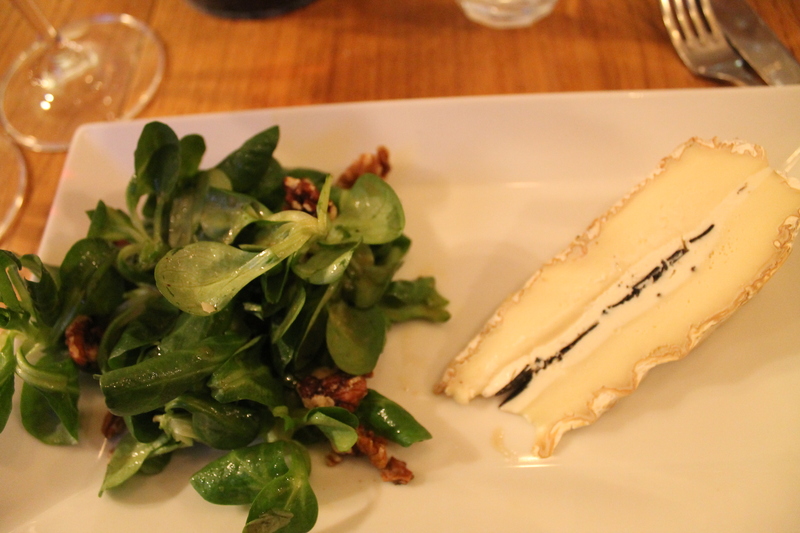 We were tucking into our meals at the Bon Coin bistro in the 5th arrondissement. 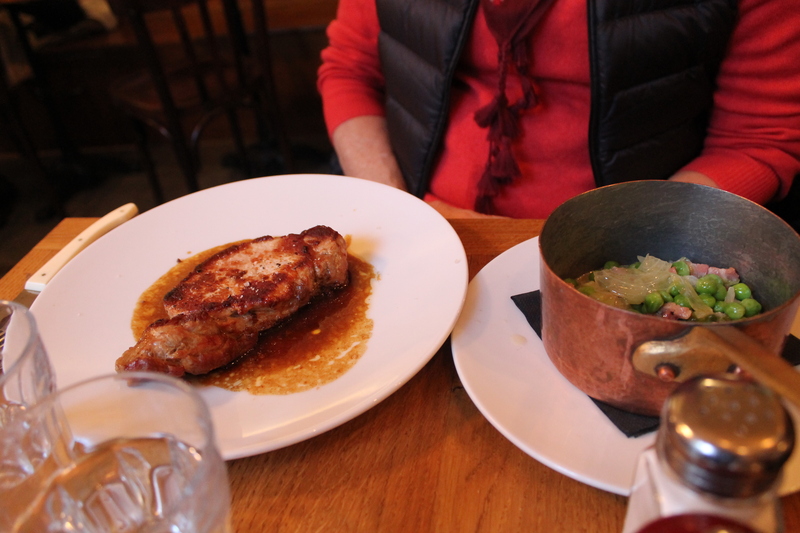 She had ordered the pork, I started off with seared foie gras and artichoke followed by a generous portion of chicken served atop a mound of mashed potato. 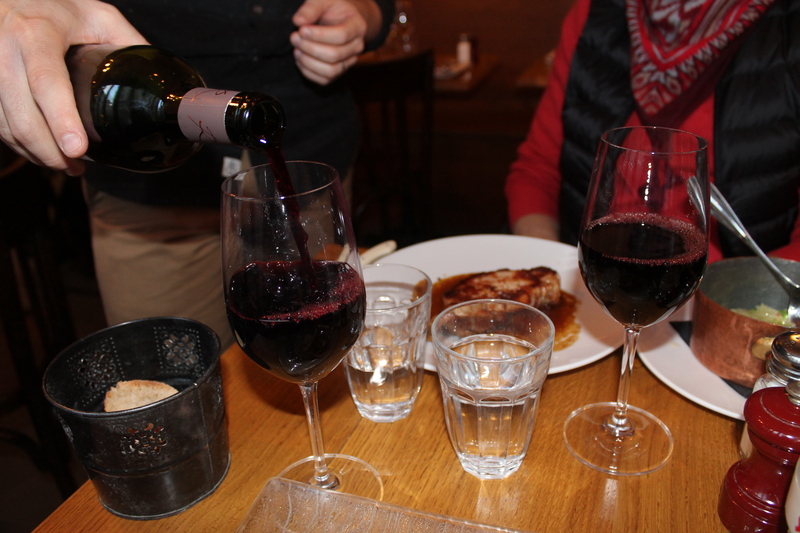 The wine, a Bergerec for Beth and a Brouilly for me, flowed copiously. As did the conversation, not only between ourselves but with the two ladies sitting at the table next to us. 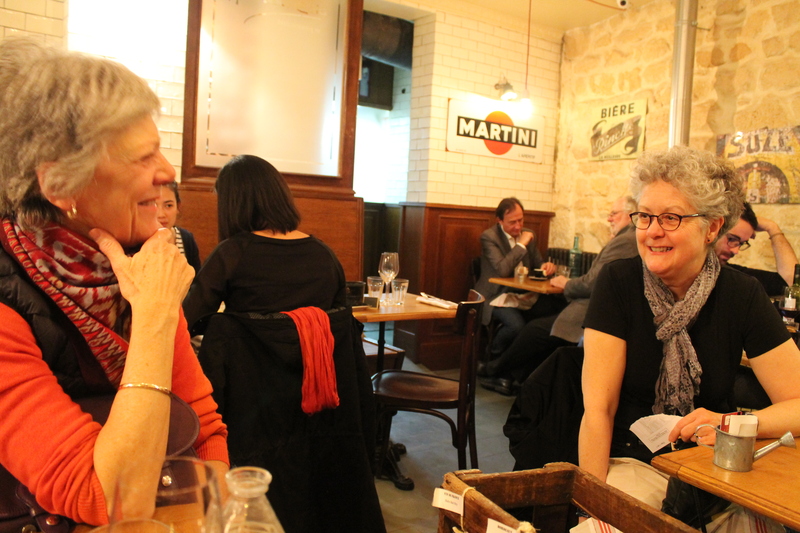 Two Bostonian ladies, as it turned out – one who has written a book on lobsters and the other who, like me, has a blog on Paris and who, unlike me, divides her time between here and the USA. We all exchanged our respective blog URL’s. Which reminds me that I must get some calling cards made up because I’m tired of scribbling my URL onto a ripped-off corner of paper tablecloth (usually wine-stained) and handing it to nice people I come across. Anyway, back to Beth. Every year at the same time she comes to Paris (from Toronto) and rents an apartment so that she can live like a Parisian. She speaks fluent French, so that helps. Then she takes the Eurostar to London for many days and then she meets up with a friend in Italy. Every year they explore a different region. This year they will be exploring the region of Cinque Terre which is a rugged portion of coast on the Ligurian Italian Rivieria. 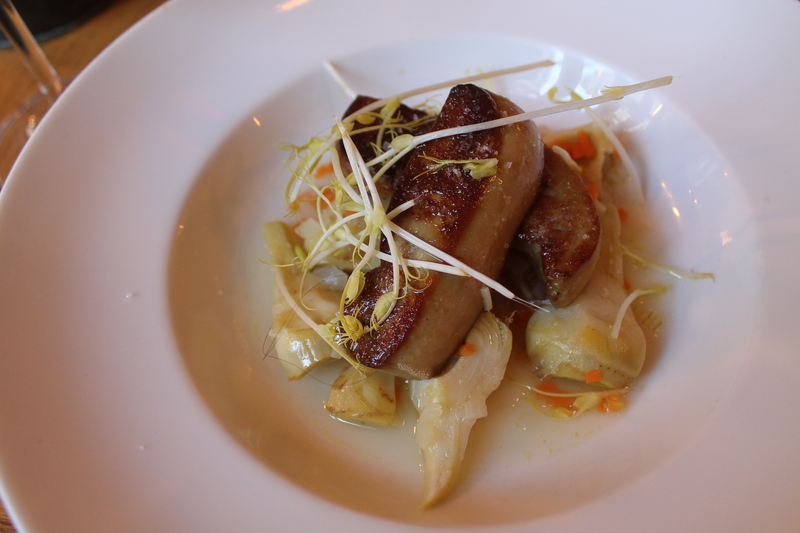 “So Beth, what is it exactly that you love about Paris?” I said through a mouthful of artichoke. I reminded her that I’ve been living in Paris for two decades and, unsurprisingly, view the city through an entirely different prism. 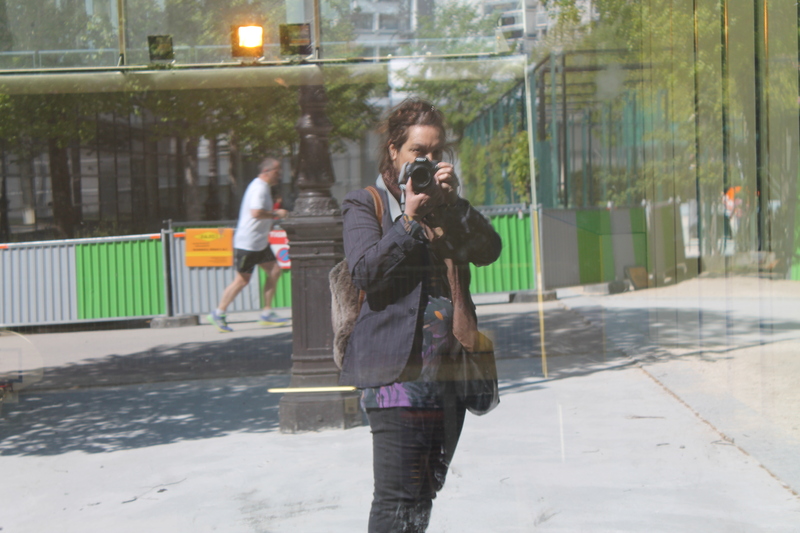 “Would you say that Paris is a multi-sensory experience?” I suggested.